Being Asia’s largest financial hub, the territory has an array of favourable conditions for the deployment of financial technologies. For many FinTech companies, having a presence in Hong Kong is important for penetrating the APAC market and carrying out key strategies of their businesses. Want to learn more about the Hong Kong FinTech ecosystem? You are in the right place. 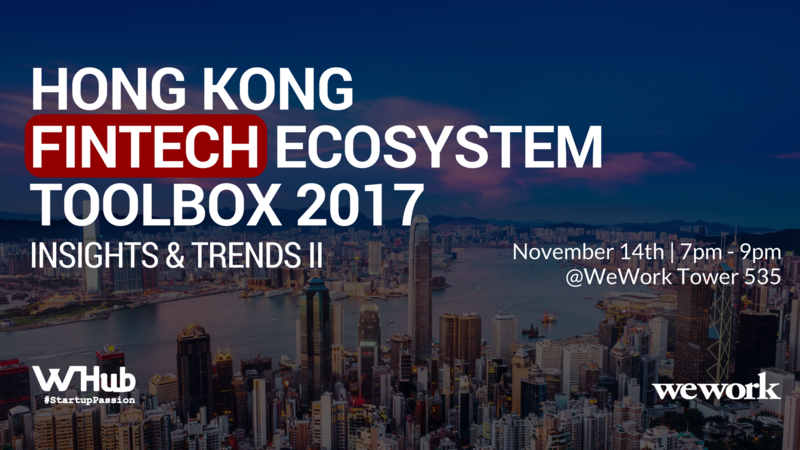 In collaboration with WeWork, we are proud to present the Hong Kong FinTech Ecosystem Toolbox 2017. where you can find a list of key players in the field and resources in the Hong Kong FinTech scene. Panel discussion with two FinTech founders/ influencers (panellists TBC). Insights about the FinTech ecosystem: What are the current FinTech trends? Join us to get a better understanding of the FinTech scene in less than 60 minutes! Networking opportunity: Meet like-minded entrepreneurs and experts from the FinTech sector, build synergy. WHub is an online startup community that helps startups to attract the resources they need such as talent, investors, and collaboration. With the passion to promote entrepreneurship and innovation in Hong Kong, WHub works closely with key stakeholders in the Hong Kong startup scene to organize and promote startup events, job fairs, expert panels and more.